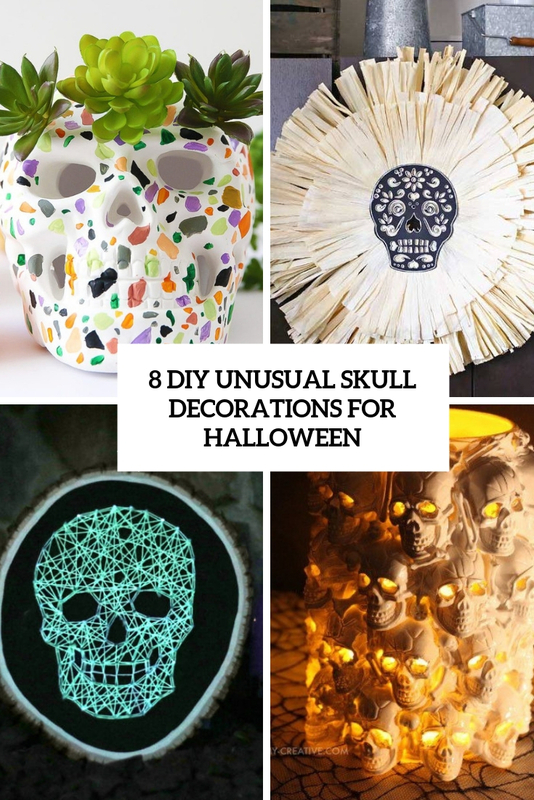 Skulls are totally traditional for Halloween and can be seen everywhere before, during and after it, plus many of use go for such decor in other time, too. Usual skulls are boring but what if you make it unusual? I’ve gathered a whole bunch of unique skulls that you can easily DIY anytime. Terrazzo is a famous material that is on top right now, and you may see more and more designer collections using it and various DIYs with it or imitating it. This skull was a great way to try recreating terrazzo painting traditional terrazzo patterns. 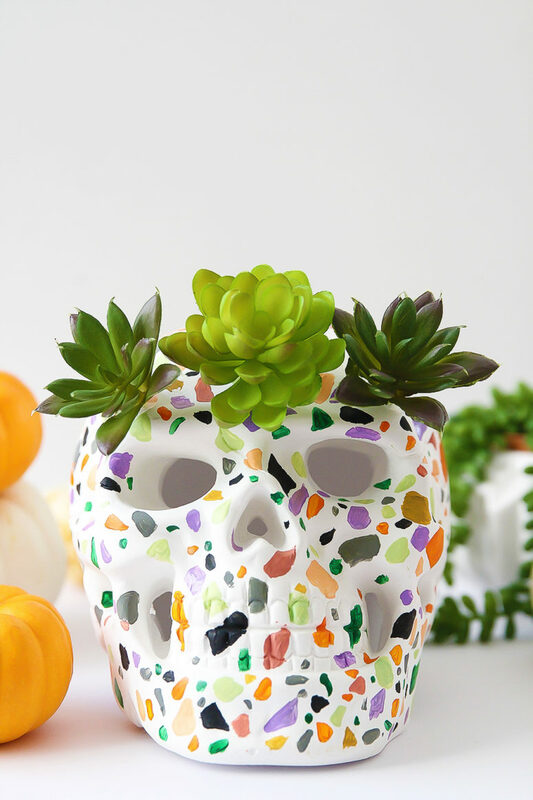 Read how to paint this cute piece and voila, you have a trendy Halloween decoration inspired by the edgy material. Halloween is a fun season for things that glow at night but you also want your decorations to look cool in the daylight. This unique Halloween decoration not only adds texture and a spooky feeling to your daytime Halloween display, but offers a fun glowing aspect at night. 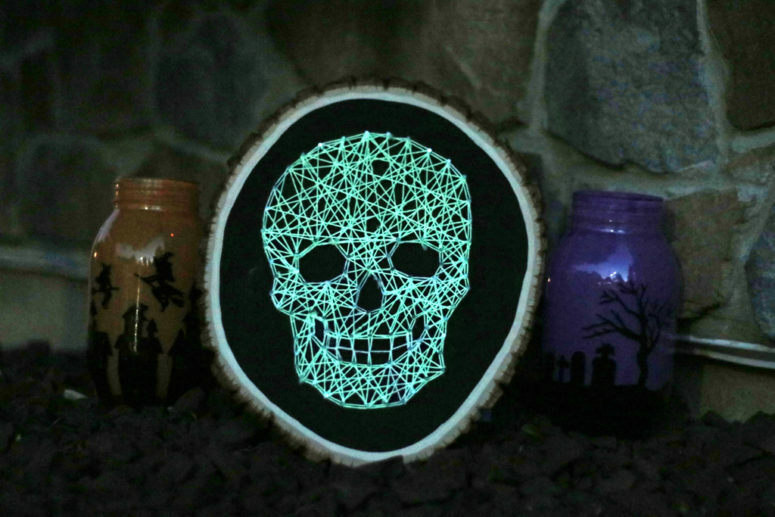 Download the free template and learn the steps to create a glow-in-the-dark string art skull this Halloween! Use these steps and any template you design to come up with countless unique pieces to deck out your haunted house this creepy season! 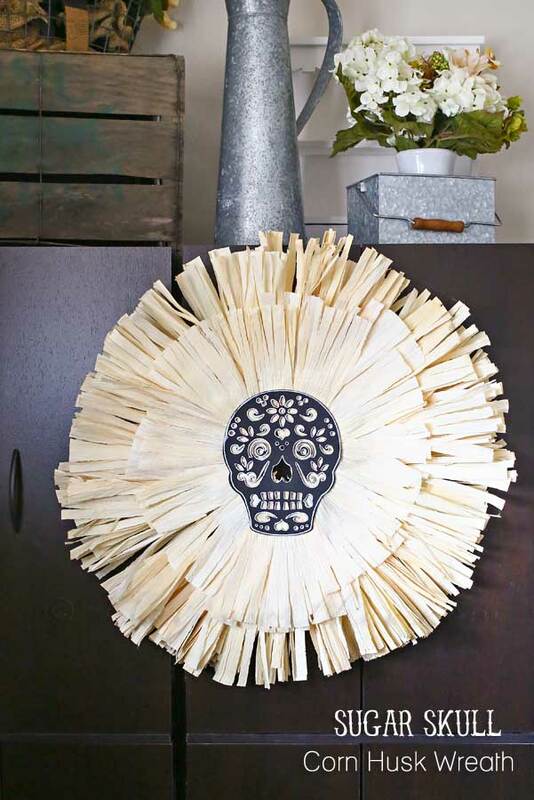 Fun Halloween crafts like this sugar skull corn husk wreath make it easy to decorate for the holiday. It’s simple and festive and perfect Halloween decor. The sugar skull is a cutout board though you may print it and attach to a piece of cardboard, too. Read how to make this original wreath for your front door. 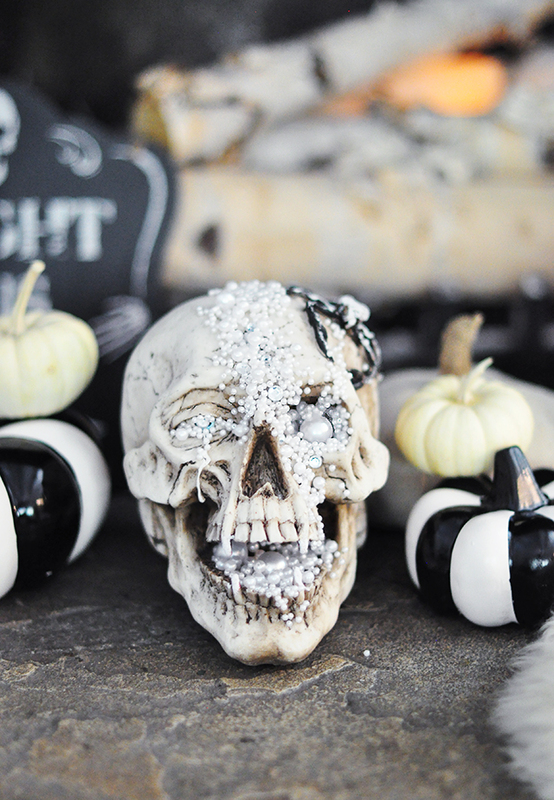 If you like glam, this tutorial will be a great idea for decorating home this Halloween. This piece reminded me of a pirate ship treasure trunk, which always seems to include a skull dripping with jewels. It’s a fun Halloween project and makes for fab decor for the season. You could also paint it beforehand, or leave it unpainted for a spooky feel. In the United States, Halloween is the holiday that falls on October 31 and is historically associated with the celebration of All Saints and all Souls days. In Mexico this celebration is called the “Dia de los Muertos” or Day of the Dead. Pumpkins are probably the most notable symbol of the US holiday, while in Mexico Dia de Muertos is tightly associated with brightly decorated skulls and orange marigold flowers. 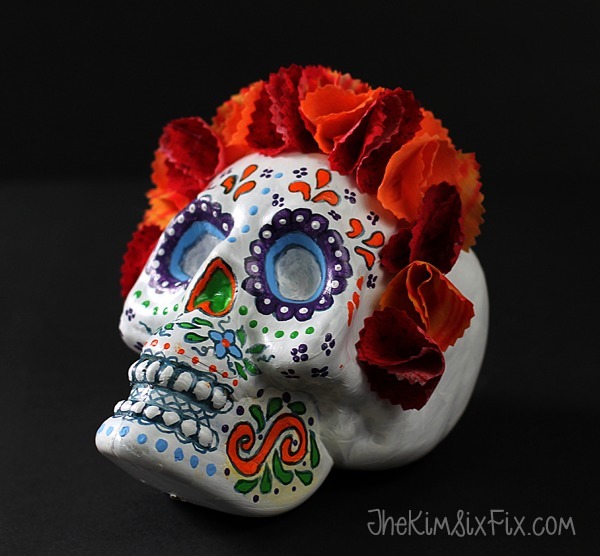 Make a special version of a Day of the Dead skull rocking the flowers and the traditional sugar skull look, read the tutorial to make one! Okay, this skull craft idea is really scary as it looks very natural! This is a boneyard lantern made of skulls and it can be really lit up – looks a bit frightening though the skulls aren’t real, of course. 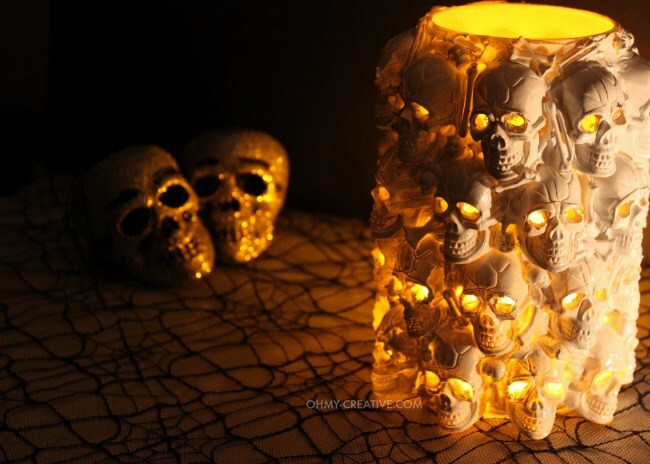 Mini plastic skulls can be used to make the lantern and you should paint it white for a natural skull look. reminds me of some Polish churches completely made of skulls and bones, eek! Did you know a little bit of shiny gold spray paint can turn a craft store find into an expensive looking piece of holiday home décor? It can! Here’s a dramatic transformation you can achieve when spraying an item gold. 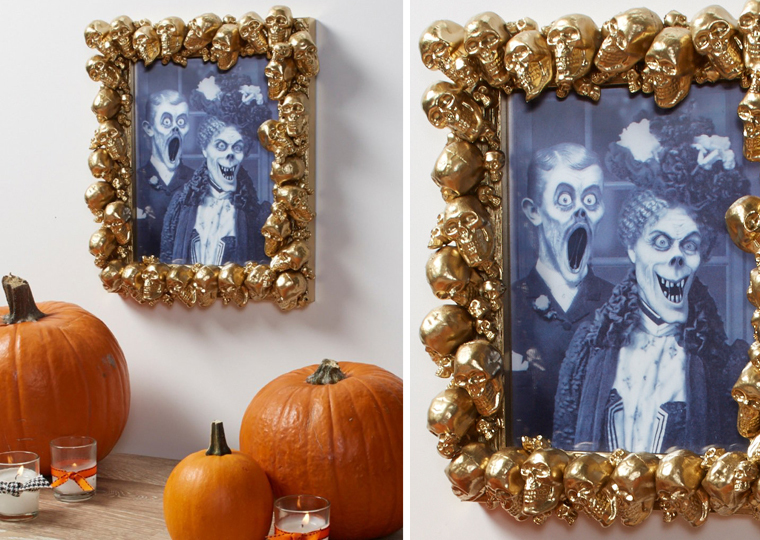 This is such an easy project with just a few items and some simple steps you can have your own gold skull frame. 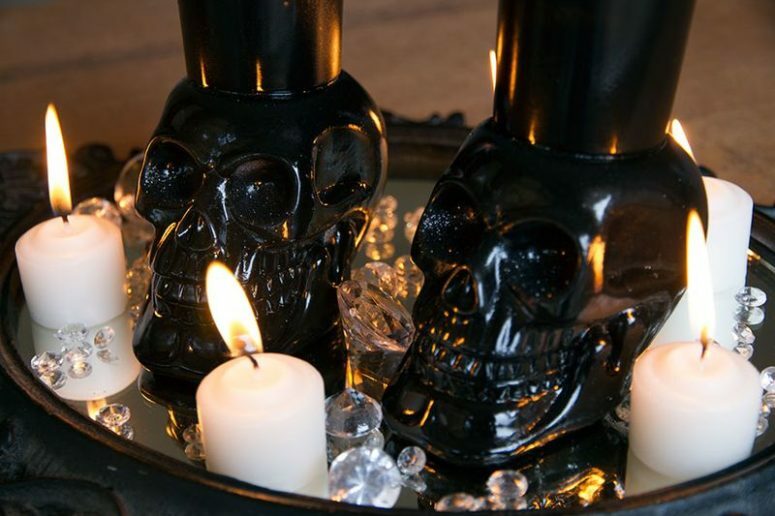 This project would look cool in any color and doesn’t need to be saved for Halloween, although it would be a cheap option for a table decoration for a party – these are cool skull votive holders. Made of absolutely cheap pieces painted right they will create a proper scary ambience.